The original Saltwood WI was formed in 1926. During World War 2 the membership expanded and had reached a total 165 by 1945. However by 1973, as the original members were becoming elderly, numbers had declined. A decision was taken to try and increase the ranks and several members canvassed young Mums at the school gates asking if they would like to join the Saltwood WI, which at the time held meetings in the afternoon. It was found that this wasn’t a popular time for meetings as many of the potential members were in fact collecting their children from school at that time of day. The idea of holding a morning WI was suggested to include a creche for children below school age supervised by WI members in the committee room of the village hall. On 10th October 1973 the first WI to meet in the morning in the East Kent area was formed. This new WI was named Castle Green WI to differentiate it from the original Saltwood WI and both groups continued to run in parallel for several years. Castle Green has built on its initial success and is still running today while the original Saltwood WI has since closed. Some of those early canvassers and young Mums from the school who joined in 1973 are still members today. The embroidery of Saltwood Castle on the table cloth we use every month on our President’s table. The images below show scans of both sides of the old and treasured 1976 membership card of one of our present Vice Presidents when she became a member Castle Green WI. 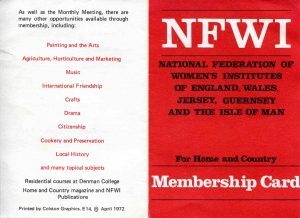 What may surprise some members, apart from the bright red colour of the card, is the rural nature of the WI in the 1970’s. At that time the WI is described as an “association of women in the rural community.” which is “open to country women of all ages and interests”.This is so very different from the 21st century when many new WI’s are formed through social media in very urban areas in towns and big cities. The card also states that members should have the “opportunity of working together to improve the conditions in the community” and for them to “consider the needs of people throughout the land”. Today the concerns of the WI are shown in this year’s resolutions: “Alleviating Loneliness” as in 1976, is a matter that directly relates to our local communities. The second resolution on “Plastic Soup in the Oceans” shows how the WI’s concerns have become much more far reaching and global over the years. Members will recognise the monthly meeting, described in the 70’s as including “WI business, a talk or demonstration, refreshments and a time for social activities”, as still being very familiar today. 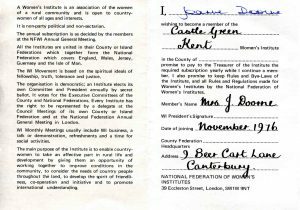 I think that we can all agree with the sentiment expressed on the 1976 Membership Card that a WI should “develop a spirit of friendship, cooperation and initiative“.These ideals are still very much at the core of Castle Green WI today in 2017!